Recently I had the opportunity to speak one-on-one with 15 extraordinary entrepreneurs who have one thing in common. They have stepped into their purpose and started businesses that not only allow them to express their passions, but monetize their gifts. For 3 days they peeled back the curtain and shared their secrets and insider tips! 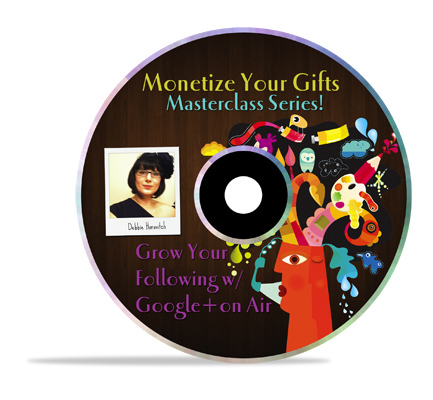 If you were not able to attend the Monetize Your Gifts Live Masterclass I have provided you with an opportunity to check out our powerful, game changing discussions. Today I’d like to give you a sneak peek of my interview with social media concierge, entrepreneur and Google+ On Air Hangout expert Debbie Horovitch who spoke on the topic of how to grow your following and be seen as an expert with Google+ Hangouts On Air. She is the author of the special report Successfully Hosting Google+ Hangouts on Air For Your Business: 8 Tips To Remember. 1. There’s a warm comfortable vibe and informal feeling about Google+ On Air Hangout and your audience will appreciate the “reality show” feel. Be yourself, people want to connect with you and your message not the glamour. 2. Move past the fear of being perfect, it doesn’t have to be, remember, “reality” sells today. approach businesses that may be interested.